Saxophist and flautist Dave Liebman, the musical equivalent of Sesame Street’s cookie monster, has done about everything from being part of the Miles Davis group in the early seventies to writing chamber music. Liebman has also been an expert educational writer and organiser. Among other endeavors, he founded the International Association Of Schools Of Jazz, stressing educational cooperation without borders. 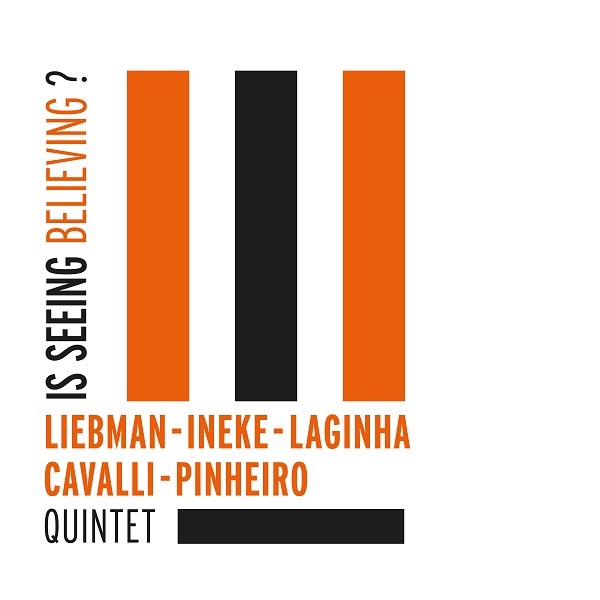 It’s this responsive spirit that’s at the heart of Is Seeing Believing, a collaboration between the five IASS colleagues Liebman, veteran Dutch drummer Eric Ineke (a longtime Liebman associate who also played on, among others, Lieb Plays The Beatles and Lieb Plays Blues à la Trane), pianist Mário Laghina, bassist Massimo Cavalli and guitarist Ricardo Pinheiro. An international cast that cooks a varied brew. Excepting a robust interpretation of Old Folks, marked by the vibes of John Coltrane’s Impulse output, courtesy of Liebman’s freewheeling, uplifting phrases and Ineke’s lush, pulled-and-pushed rhythm, and the Post Bop-meets-Gypsy-meets-Dixie-meets-Prog Pinheiro tune Ditto, the repertoire is soft-hued, introspective, a gentle but stirring lake of intricate, fine-tuned jazz. A conversation between Liebman’s sensual soprano and Pinheiro’s spicy acoustic guitar is the centre of the warm-blooded piece of folk jazz, Coração Vagabundo. On the other tunes, Pinheiro plays electric guitar, employing a prickly, Jim Hall-ish sound, and daring to turn into eccentric pathways during his concise stories. Like in the sprightly take of Skylark, wherein Liebman and Pinheiro improvise simultaneously. With the wisdom of the elder master, Liebman’s tenor work is spirited without excessive frills. The highlight is the title track, a composition of slow-moving voicings that meander on the sensitive, resonant sound carpet of Ineke, which nicely lets the personalities of the soloists ring through. Pianist Mário Laghina’s embrace of the melody is enamouring, sometimes following the steps of Liebman, sometimes going against the grain teasingly. Part of an album of moving and intelligently crafted modern jazz. Find Is Seeing Believing? here.